I’ve now been on both ends of the webinar experience. I’ve attended my share of good and bad ones. The worst was when the moderators didn’t have master control over the microphone, so we were treated to people’s keyboard clicks, phone calls and, most embarrassingly, one group on speakerphone who provided running negative commentary on the proceedings. And I’ve had a few glitches myself in my short career as a web presenter. I am easily distracted, so peoples’ comments and questions in the chat window about technical issues they were having really threw me off. Pro tip: leave that stuff to the moderator! So I was pleased that PR Daily published my 10 Tips for Delivering a Riveting Webinar Presentation. In addition to my advice, it’s full of links to great resources by Seth Godin, Design Shack, SquarePlanet and others. I think webinar technology has a long way to go to measure up to live, in-person presentations. Someday (hopefully), it will provide a natural, seamless experience, where people can really see each other and interact instantly. In the meantime, there is a lot the presenter can do to make the experience better for the audience. In fact, a lot of it is on the presenter’s shoulders. Ordinary mistakes in a live setting are magnified ten-fold in the surreal environment of the webinar. So check out the article and let me know if I missed anything. Yes, yes, and yes! 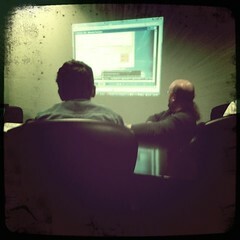 Working for a visual company myself, I agree that more is not more when it comes to either video or PPT frames. Keep the message visual and as simple as possible. Most people remember pictures and stories first, then topline bullet points, etc. Great job Rob. I love sharing Seth Godin’s posts and now I’m enjoying sharing yours! Thank you, Beth — so glad you found this useful! Good point about the mic. Maybe I should invest in a decent one, though, believe it or not, I’ve used my iPhone earbuds and that seemed to come across okay. I emailed the article to the organizer of the first webinar I did and she added another technical tip: avoid wifi connections. They can make the video choppy and put the audio out of sync so it looks like you’re dubbing a bad Japanese monster movie!